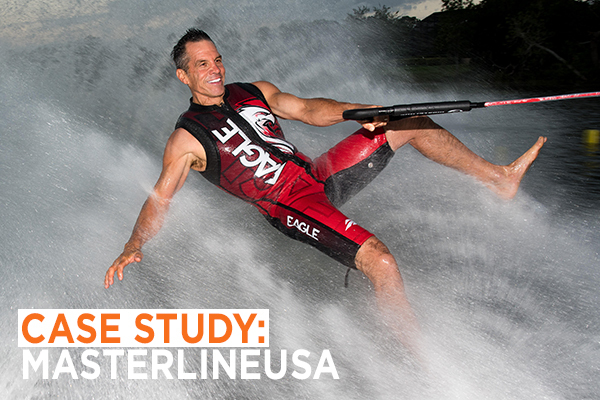 MasterlineUSA, located in Winter Garden, FL, is the manufacturer and distributor of the top waterski rope and handle in waterskiing. The sell manufacture and distribute Eagle Vests and Quantum Trick Skis. Their products are known world-wide for being the best in the industry and are used by the world’s top amateur, pro and junior skiers. The company is family owned and operated for more than 20 years. In November 2016, Masterline USA generated $28,000 in online sales through their Shopify Store. This November 2017, Masterline generated more than $78,000 in online sales; a 250% increase in online sales. It was their most successful month ever selling online, for a company that has been around more than 20 years. 2017 was a huge year for Masterline online as online sales increased 7 of 9 months by at least 200%. And we did it by NOT discounting every time we promoted on social media, email and through Facebook ads. For 8 months, we’ve been at it. Posting consistently and promoting the Masterline brand. Doing so significantly increased web traffic for Masterline. Not only did this bring new visitors to the website, it gave us the ability to REMARKET, or send ads to previous website visitors using Facebook’s customized conversion pixel tracking. Posting approximately 5 days/week on Instagram has grown the page from 800 to 10,000+ followers. The growth in followers and the number of posts directly led to sales. By directing their social followers to their website, we created custom audiences we can run ads to. Social itself (in our humble opinion) should never sell your product like a billboard. However, it can grab exposure for your brand, direct traffic to your website and give you the ability to follow up and convert that traffic. The key here was the follow through. Monthly blogs have also played a key role in driving traffic to the website (this is where we direct our followers to). Each blog visitor receives an ad with 20% off their first purchase. Those first time purchasers grow our email database and gave us the ability to send them personalized products in the future. Is Email Dead? Sure isn’t, We Made 15k JUST from our Black Friday Deals. The best customer is the customer you already have. They are familiar with your brand, your products and process. They trust you. This is why keeping an email list is important. So many brands focus 80% of their effort on customer acquisition. With Masterline, in year 1 of our marketing efforts, we’ve focused 80% instead on the current customers they already have and the email list they’ve built over the years. $15,000 of our sales from Black Friday are from our email list. This is where the ROI of developing your email list pays off. With customer trust already in the fold, we knew we could get a little risky by getting customers to spend more. Considering the average order was approximately $180 previously, we knew we could get customers to spend a little more, by giving them a little more for their money. We increased the average order sale by giving added value to customers by giving them discounts for bundling items. Through November, this increased the average order price to approximately $220. Up more than $40 per online order. Instead of just buying a rope for $129.99. Buy a rope and handle (normally $119.99) for the bundle price of $174.94. All year, Masterline sold only 5 trick skis throughout the summer. In the month of November, they sold 18. The trick ski retails for $660. So we created a Trick Ski Bundle that included the Quantum Trick Ski, a Masterline Rope and Handle, plus the bindings for $661. This was one instance we used a discount to increase order value. The bundle was 30% off when purchased all together. Throughout the rest of the year, the bundle price will hover between 10-15% off for that same package. All in all, Masterline sold 82 BUNDLES IN NOVEMBER. They’ve never bundled any products before and it significantly increased their order value and their top line revenue.